This week (6 Tammuz) we commemorate the Hashcabah of Rev. Gershom Mendes Seixas, the first minister of Mikveh Israel, who died July 2, 1816. Rev. Seixas was born on January 14, 1745 in New York City, to Isaac Mendes Seixas and Rachel Levy. Rachel Levy was the daughter of Moses Levy, who was one of the most prominent merchants in New York at the time. Her brother was Nathan Levy, whose request for a parcel of land for a burial ground in Philadelphia in 1740 is considered to be the origins of Congregation Mikveh Israel, as the starting of a community often begins with the establishment of a sacred burial place. He was thus the first American-born minister of Shearith Israel, and one of the few American-born ministers of Mikveh Israel to the present day. It’s interesting to note that Gershom’s mother, Rachel Levy, was Ashkenazi, which made Gershom half Sephardi and Half Ashkenazi, mirroring the makeup of both the congregations in New York and Philadelphia. Seixas became the minister of Shearith Israel in July, 1768 at the age of 23. He had been born and raised in the Shearith Israel community. His teacher and mentor, Joseph Jessurun Pinto had served the New York congregation for 8 years before he suddenly had to leave for Europe in 1766. He later became the minister of the Sephardi community in Hamburg. After Isaac Cohen Da Silva served for a brief 2-year term, the Jewish community in New York, numbering only 300 people, unanimously elected the young Gershom Seixas as hazzan. Seixas served as the spiritual leader of the congregation, and also as the supervisor of Kashrut, performed all marriages and funerals, was the mohel, and for a time served as the shohet – the ritual slaughterer for the congregation. At age 30, Seixas married Elkalah Cohen on September 6, 1775. Together they had 3 children over the next 10 years: Benjamin, who died unmarried; Sarah Abigail, who married Israel B. Kursheedt; and Rebecca Mendes, who also never married. Elkalah passed away in October, 1785. He then married Hannah Manuel on November 1, 1786, with whom he had 11 additional children. She was only 20 years old at the time of the marriage, and survived her husband by 40 years, living well into her 90th year. One of their children, David Mendes Seixas, was the founder of the Pennsylvania Institution for the Deaf and Dumb in Philadelphia, and was also a pioneer in discovering ways to burn anthracite coal. Rev. Seixas was a strong advocate of American Independence, and has been given the nickname, The Patriot Jewish Minister of the American Revolution. In 1775, with the British Army fast approaching New York City, Seixas persuaded a majority of the congregation to close Shearith Israel rather than continue operating under the coming British occupation of Manhattan. He then packed up the Torah scrolls and other artifacts and books and moved them, along with his family, to his father-in-law’s home in Stratford, CT. 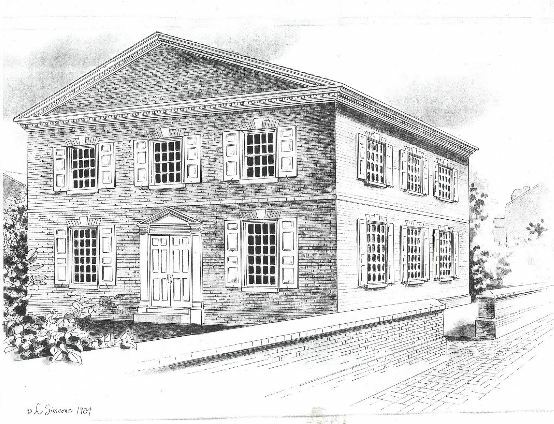 In 1780, Congregation Mikveh Israel in Philadelphia invited Seixas to become the minister of the congregation. He arrived on June 6, and immediately began helping to create an established Jewish community in Philadelphia. With the influx of members of Shearith Israel, including the leaders of the New York Jewish community, the number of Jews in the city grew from about one hundred, to over a thousand people. The New Yorkers, including Jonas Phillips, Hayman Levy, Gershom’s brother Benjamin Seixas, Simon Nathan, and Isaac Moses, used their experience at Shearith Israel to work with the Jewish leaders in Philadelphia, including Michael and Bernard Gratz, and Haym Salomon who had arrived some two years prior, to establish a form of prayer, a method of government, and a system of keeping records for the nascent Mikveh Israel. A Board of Adjuntos and officers were elected, and the congregation then began the project to design and build its first synagogue building. Seixas led the construction to its completion and carefully planned the consecration ceremony which was held in time for Rosh Hashanah in September, 1782. At the close of the war in 1783, many of the refugees from New York returned to their homes and rebuilt the Jewish Community there. Congregation Shearith Israel invited Seixas back to New York to lead the congregation as minister once again. In spite of being established and comfortable in Philadelphia, he agreed, and , and four months after the British evacuated Manhattan, on March 23, 1784, Seixas resumed his duties as minister. He exchanged places with the minister in New York during the latter years of the war, Jacob Raphael Cohen, who came down to Philadelphia to serve as its minister. Each served their respective communities with distinction for the rest of their lives. In addition to serving his own community, Seixas was very involved in the building of the greater Manhattan community as a whole. He frequently worked closely with the clergy of other faiths in fellowship for the greater good. Seixas was one of fourteen clergy to participate in the inauguration ceremony for George Washington as the first President of the United States. In 1787, he was invited to be a trustee of Columbia College, serving until 1815. He was one of the incorporators when Columbia was officially incorporated and his name appears in their charter. Upon his death, the Trustees, in gratitude, commissioned a memorial medallion with his likeness. He was also a trustee of the Humane Society, a member of the Board of Regents of the University of the State of New York. He also established a New York bet din for deciding disputes. Rev. Seixas was not the only high-achieving, successful child of Isaac Mendes Seixas and Rachel Levy. His brother Benjamin was a prominent merchant in Newport, Philadelphia and New York, and was one of the founders of the New York Stock Exchange. He was also a member of the board of Mikveh Israel for many years. 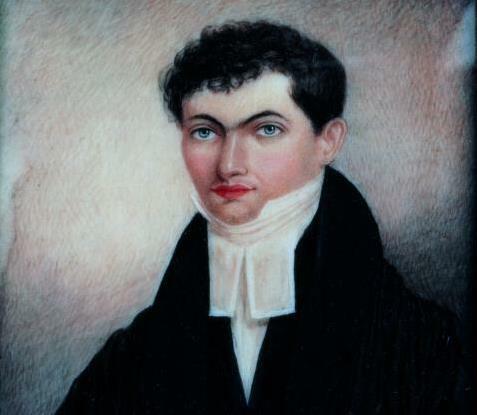 Benjamin’s son became the minister of Shearith Israel in 1828. Gershom’s brother Abraham served as an officer in the American army and carried dispatches for Gen. Harry Lee in the south. His brother Moses, the eldest, was one of the founders of the Newport Bank of Rhode Island. It was Moses Seixas who drafted a letter, in the name of the Newport congregation to George Washington upon Washington’s visit to Newport. Washington responded with a beautiful letter expressing his appreciation of the good wishes and his strong views in favor of religious tolerance. Wednesday, June 5, 2013 is the annual Fellowship Dinner between Christ Church and Mikveh Israel. Christ Church was founded in 1695. It was one of the first religious institutions in Philadelphia, and the first parish of the Church of England in Pennsylvania. Mikveh Israel is known as “The Synagogue of the Revolution” because of the active role played by many members of Mikveh Israel in the activities leading up to the Revolution, the Revolutionary effort itself, and the formation of the United States after the war was over. Similarly, Christ Church is known as “The Nation’s Church” because of the famous Revolution-era leaders who worshipped there. Among the parishioners of Christ Church were Benjamin Franklin, Betsy Ross, George Washington and John Adams. The friendly relationship between Mikveh Israel and Christ Church goes back to pre-Revolution days. Benjamin Franklin organized 3 lotteries to raise money for the construction of Christ Church. Members of Mikveh Israel were among the people who purchased tickets and contributed money. Later, in 1788, when Mikveh Israel was suffering financially after the Minister, Gershom Mendes Seixas, and several other members returned to New York after the revolution, the congregation sent out a solicitation to members of all faiths for support. The sum of 800 pounds needed to be raised, and after obtaining permission from the City, a lottery was established. Many of the members of Christ Church stepped up to help. One of the first contributors was Benjamin Franklin, who gave 5 pounds, a large sum for an individual donation at the time. The close relationship between the two congregations was brought to public display on Independence Day, July 4th 1788. Philadelphia was the largest city in the country and where the Continental Convention had spent the last three years drafting the US Constitution. Though the Constitution was accepted by the Convention on September 17, 1787, it was finally binding on all the states when the ninth state, New Hampshire, ratified it on June 21, 1788, just two weeks before Independence Day. Time for a parade! The morning of the 4th dawned to the peal of the steeple bell of Christ Church, followed by a cannonade from the ship Rising Sun, which was anchored off Market Street. Seventeen thousand onlookers gathered to watch successive troops of marchers. Each group were represented – professionals, artisans, farmers, and more. The military companies were first, then the ministers. The Pennsylvania Packet of July 9, in its account of the parade, reported, “the clergy of different Christian denominations, with the rabbi of the Jews, walking arm in arm”. Benjamin Franklin, though at 82 too sick to attend the parade, watched as it passed beneath his window. He had overseen, with the chair of the committee on arrangements, Francis Hopkinson, who was also a signer of the Declaration of Independence, “the clergy of almost every denomination united in charity and brotherly love”. This was nowhere more evident than when, at the end of the parade where people gathered at tables heaped with food and drink, the Jewish Patriots were escorted to their own separate table of kosher food. Benjamin Rush, also a signer of the Declaration of Independence and a delegate to the Pennsylvania ratification convention, on watching the scene, wrote, “The clergy formed a very agreeable part of the procession. They manifested the sense of connection between religion and good government. Pains were taken to connect ministers of the most dissimilar religious principles together, thereby to show the influence of a free government in promoting Christian charity. The Rabbi of the Jews, Jacob Raphael Cohen of Congregation Mikveh Israel, Philadelphia’s only synagogue, locked in arms of two ministers of the gospel was a most delightful sight. There could not have been a more happy emblem contrived of that section of the new Constitution, Article VI, prohibiting religious qualifications for holding office, which opens all its power and offices alike not only to every sect of Christians but to worthy men of every religion”. Fast-forward to 1938. After the retirement of Minister Louis Washburn, the Christ Church vestry (board) chose Reverend Edward Felix Kloman to take over as the Minister of the congregation. Kloman was an extremely energetic and personable man dedicated to Public Services and the betterment of the community. He immediately made friends with many local businessmen, as the residential neighborhoods near the church had largely disappeared. The Old City section of downtown was very run down in those days, having just endured the Great Depression and still suffering its aftereffects. Kloman established volunteer groups to take care of the needs of boys, girls, young families, and older residents. The groups welcomed participants from all races and creeds. Kloman believed strongly that the Church should play a role not only in the spiritual development of the neighborhood residents, but also in the general well-being of the neighborhood. He was very much bothered by the filthy streets and unpleasant environment of the Old City area. In 1941, Kloman, along with a group of local businessmen, formed the Old Christ Church Neighborhood Businessmen’s Association. Foremost among the members was the Treasurer of Mikveh Israel, David Grossman. Grossman was a local businessman who owned a furniture and rug warehouse at Second and Market Streets, where it remains today. Though Grossman was Jewish and was somewhat reluctant at first to serve, he soon became a great friend to Christ Church and did a lot to foster fellowship and cooperation between the church and Mikveh Israel. Grossman served as Secretary of the Association, whose stated purpose was, “the bringing together of the businessmen of the oldest business district in America for the better acquaintance with each other and cooperation for the good of all in the neighborhood”. The group met monthly for lunch and by 1945 had grown to 250 members from all walks of life and a variety of religions. Aside from the social gatherings, the accomplishments of the Association included cleaning the streets, finding jobs for the unemployed, co-signing loans for those in need, and raising money for the war effort. They increased direct contributions from their district as well as raising the sale of war bonds. Since the effort was led by businessmen of all faiths, it did much to encourage participation in other church efforts in the area. Largely in response to the atrocities committed by the Nazis in World War II, Kloman reached out to the Jewish Community, many of whom were already friends of Christ Church through their membership in the Neighborhood Businessmen’s Association. He established a special and long-lasting friendship with Mikveh Israel. Every year, on Armistice Day, the Association would sponsor a “prayer for peace”, led jointly by Kloman and Reverend David Jessurun Cardozo, Minister of Mikveh Israel. In 1943, Kloman, along with David Grossman, Rev. Cardozo, and other members of both institutions who were active in the Association came together to establish an annual Fellowship Dinner that is alternately hosted by Christ Church and Mikveh Israel to this day. 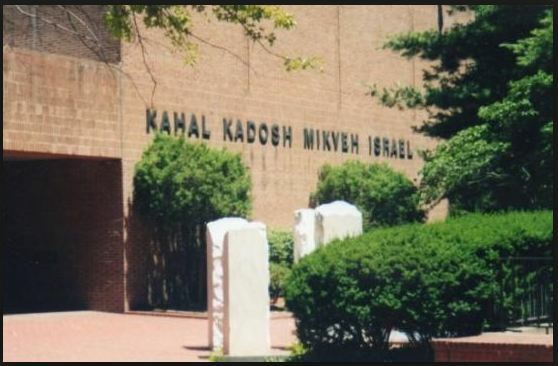 Mikveh Israel began its effort in the 1950’s to move from its location at Broad and York Streets to its present location on Independence Mall. In 1961, it officially announced that would move to Center City, and established a building fund to raise money for the new synagogue building. The very first contributor to the fund was Christ Church, who donated $1,000 in May, 1961, presented at the annual Fellowship Dinner, held to commemorate and celebrate the close friendship between these two great and historical Philadelphia institutions. There have been many Jews in the United States Armed Forces and many Jewish heroes in all of America’s wars. Many members of Mikveh Israel served with distinction throughout the history of the United States, with many of them making the ultimate sacrifice in service to their country. Perhaps the most famous of all of them, though, was Uriah Phillips Levy, the first Jewish Commodore in the United States Navy. Uriah Phillips Levy was born on April 22, 1792 (30 Nissan 5552), and though the country itself had just won its independence 8 years before his birth, his American roots ran deep. Uriah was the grandson of Jonas Philips, who was instrumental in the construction of the first synagogue building of Mikveh Israel, solidifying the congregation and serving as Parnas at the time of its dedication. Jonas Phillips was born in 1735 in Prussia, though of Spanish descent, and arrived in Philadelphia via Charleston, New York, and London, in 1762 where he married Rebecca Mendes Machado, the daughter of a former Hazan of Shearith Israel Rev. David Mendes Machado. Rebecca was only 16 years old at the time. It is told that George Washington attended and danced at their wedding in Plymouth Meeting, PA, being listed among the guests as “a planter from Virginia”. Jonas failed in his first few attempts at business, first in retail and then as an auctioneer, and had to resort to performing duties as a Shohet (ritual slaughterer) for Congregation Shearith Israel in order to feed his growing family. Eventually, he would have 21 children, almost all of them surviving to adulthood and most of them becoming prominent members and leaders of Mikveh Israel in Philadelphia, Shearith Israel in New York and the secular communities in both cities. After New York proved to be a difficult place for Jonas to become successful, he finally moved the family permanently to Philadelphia in 1774, where opportunity was abundant and success came to him more easily. He went into the dry goods business and eventually became the second richest Jew in Philadelphia, according to city records. Jonas Phillips was an ardent patriot and strong believer in the American cause. He was also a proud Jew who publically advocated for the rights of his brethren and led his congregation by example. This was a strong influence on his grandson Uriah with whom he was very close, and which guided and strengthened the young man during his entire lifetime, where he faced adversity through anti-Semitism and jealous rivalry. In 1787 Jonas Phillips’ daughter Rachel, whose twin sister had died in infancy, married Michael Levy. Their wedding was an elaborate one which is described in detail in a letter written by Dr. Benjamin Rush to his wife. This is the only known surviving written description of a Jewish wedding from the 18th century. Not much is known of Michael Levy. Many stories were told by his grandson and Uriah’s nephew, Jefferson Monroe Levy, about how Michael descended from Asser Levy, who was one of the original 23 Jews to land in New Amsterdam (later New York) in 1654, but these stories have long since been disproved. We know that Michael Levy was a charter member of the German Ashkenazic congregation Rodeph Shalom in 1802, and therefore was very unlikely to have descended from the prominent families of the Spanish and Portuguese congregations. He was born of a German family in London in 1755, and likely came to America, possibly Virginia, when he was about 10 years old. He did serve in the American army during the Revolution. His profession was making and selling clocks and watches. In 1770, Jonas Phillips had been a signer and strong supporter of the New York Non-Importation Agreement. In 1776, when the British occupied Manhattan, Phillips used his influence to close down Shearith Israel rather than continue under the British. Phillips himself had already removed his wife and 15 children to Philadelphia and many of the members of the New York Congregation followed him there. In 1778, Phillips joined the militia in Philadelphia, enlisting as a private under Colonel Bradford. After his service, he supplied the continental army with dry goods, food items, and other needed materials. Following the war, he appealed to President Washington and the Continental Convention drafting the new Constitution of the United States in a letter dated September 7, 1787. His concern was that all office-holders in the new government were to be required to swear allegiance over the Christian Bible. He writes, “to swear and believe that the New Testament was given by divine inspiration is absolutely against the religious principle of a Jew and is against his conscience to take any such oath”. In his eloquent and impassioned letter, he argues that, “during the late contest with England [the Jews] have been foremost in aiding and assisting the States with their lives and fortunes, they have supported the Cause, have bravely fought and bled for liberty which they cannot enjoy”. He wrote the letter for “my children and posterity and for the benefit of all the Israelites throughout the 13 United States of America”. Against this backdrop, and with a strong guiding influence from his grandfather, Jonas Phillips, Uriah Phillips Levy began his long and successful service to his country and his people. He was drawn to the sea from a very early age, spending a lot of time on the docks of Philadelphia watching the great sailing ships and learning their names and flags as they came in and out of port, loading and unloading their cargo. In 1802, at the age of 10, Uriah ran away from home in the middle of the night to join the trading ship New Jerusalem as a cabin boy. He accepted a 2-year appointment and returned to his family and synagogue just in time for his Bar Mitzvah at Mikveh Israel. After trying and failing to convince the young Uriah to join the family business in retail trade, Uriah’s father in 1806 apprenticed him for four years to one of Philadelphia’s leading ship-owners and a close family friend, John Coultron. Uriah served as a seaman on the schooner Rittenhouse. In 1807, President Jefferson imposed an embargo on all trade with Europe, idling the ships and leaving nothing for Uriah to do. Mr. Coultron took this opportunity to send his young apprentice to a school for navigation led by an ex-lieutenant of the British Navy. When the embargo was lifted, Uriah was off again to sea with far more skills and maturity than before. By the time he was 18, Uriah had already made several profitable voyages, serving in all of the different capacities during his apprenticeship including cabin boy, ordinary and able-bodied seaman, boatswain, third, second, and first mates, and captain. By the age of 19, Uriah had earned enough money to purchase a one-third interest in a trading ship, the new schooner called the George Washington, named for the first names of his two partners George Mesoncourt and Washington Garrison. When not at sea, Levy was very careful to carry his certification of American citizenship, as British impressment gangs prowled the city looking for young men to force into service in the British Navy. These “protection papers” were usually enough to thwart impressment, so Uriah wasn’t worried when a squad of British marines from the Vermyra approached him. On showing them his credentials, they remarked “You don’t look like an American. You look like a Jew.” Uriah Levy replied, “I am an American and a Jew.” After an insulting remark, the hot-headed Levy displayed the high-handed defensive spirit and refusal to be denigrated that shaped his stormy career throughout his life. He was pressed into service against his will and forced to serve on the Vermyra for a month before he was released. During that time, the commander of the ship, recognizing Uriah’s skills and spirit, repeatedly demanded that Levy join the British Navy. Levy refused, stating “Sir, I cannot take the oath. I am an American and cannot swear allegiance to your king. And I am a Hebrew and do not swear on your testament, or with my head uncovered.” Finally, after an audience with the British Naval Commander in Jamaica, his papers were deemed to be in order and he was released on the condition that he find his own way home. On one of his first trips commanding the George Washington, Levy picked up a cargo of corn which he sailed to the Canary Islands and sold for 2,500 Spanish dollars and fourteen cases of Teneriffe Canary wine. On his way back to the States, his crew mutinied, stealing the ship, the money and the cargo. Levy barely escaped with his life. Using another ship and determined to bring the mutineers to justice, he hunted them down, finally finding and overtaking them in the Caribbean. He brought them back to Boston, where the leader was hanged and an accomplice received a life sentence. By the time he arrived home in 1812, the United States had declared war, for the second time, against Great Britain. Levy, barely 20 years old, chose to serve his country in the war over a lucrative career as a privateer. He chose to apply for a commission as a sailing master over the more usual entry as a midshipman. The sailing master handled all aspects of navigation and during sea battles took over the operation of the ship while the captain directed the fighting. Later he explained his choice, saying “I sought this particular position in the belief that my nautical education and experience would enable me to render greater service to my country”. His commission from President James Madison came through in October, 1812, and he was assigned to the USS Argus, where his first assignment was to transport William H. Crawford, the new minister to France, to his post in order to entreat the French for support during the war. After depositing Crawford safely in France, the Argus began a short but very successful run as “the dreaded ghost ship” that attacked and destroyed much larger British ships in the Channel. Levy received a temporary promotion to Lieutenant and assigned the task of boarding, destroying, or commandeering the captured ships. While transporting a valuable ship, the Betty, to a French port, the Argus was finally overpowered and destroyed, with the captain and most of the crew killed. Meanwhile, the unarmed Betty was captured, and Levy spent the duration of the war in prison until he was released in a prisoner exchange after the war. Levy was assigned to the USS Franklin in 1816. He was met there with prejudice and ostracism. Soon afterwards, while dancing in full uniform at the Patriot’s Ball in Philadelphia, a somewhat drunk Lieutenant William Potter bumped Levy on the dance floor. After a second and then a third forceful collision, Levy turned and slapped Potter across the face. Enraged, Potter cursed Levy as a Jew, to which Levy responded, “That I am a Jew, I neither deny nor regret”. The two were separated and Potter led away. The following morning, Levy received a formal challenge to a duel. Levy was not anxious to fight a man over a dance-floor incident and offered to shake hands and forget the whole thing. Potter refused and they agreed to a pistol duel in a meadow in New Jersey, as dueling had been outlawed in Pennsylvania. Asked by the judge if he had anything to say, Levy asked permission to utter a prayer in Hebrew, the Shema, and then said, “I also wish to state that, although I am a crack shot, I shall not fire at my opponent. I suggest it would be wiser if this ridiculous affair be abandoned”, to which Potter replied, “Coward!”. Levy gave Potter the first shot, which went wide. Levy then simply pointed his pistol in the air and fired. Potter reloaded a second round and fired, again wide of the mark. Levy reloaded and again fired into the air. A third and fourth shot missed Levy, each time returned with harmless shots into the air. Finally, a fifth shot nicked Levy’s ear. After Potter loaded for a sixth shot, Uriah took careful aim and fired into Potters chest, killing him instantly. The affair created quite a stir in Philadelphia and the press who praised Levy for his honor. He was acquitted during his subsequent court martial. Judged to not have been the provocateur nor the aggressor, his case was dismissed. He was also acquitted by a jury in the civil indictment brought against him. Following this incident, Levy received his official promotion to Lieutenant. The jealousy and prejudice expressed both by those passed over in favor of Levy and among those whose ranks he joined began a career of ceaseless persecution and undeserved punishment simply because he was a Jew. Back in Philadelphia, a friend took him aside and strongly advised Uriah not to pursue a career in the Navy. He warned him that though nine of ten commanding officers wouldn’t care that Levy is Jewish, the tenth will make his life hell. According to his memoirs, Levy responded, “What will be the future of our Navy if others such as I refuse to serve because of the prejudices of a few? There will be other Hebrews, in times to come, of whom America will have need. By serving myself, I will help give them a chance to serve”. Three years later, his troubles resumed while serving as the third lieutenant aboard the United States. On presenting himself for duty, he was rejected twice by the captain on account of his being a Jew. The commodore had to get involved to secure the position. It was aboard the United States that Uriah witnessed his first flogging. He was so horrified that he worked for the rest of his career to end the practice. After getting into a fight with another lieutenant over a small issue, the vindictive captain ordered a court martial and had Levy dismissed from the Navy. President Monroe reviewed the case and reversed the decision. But by the time this had happened, Levy had another fight over an even more trivial matter and now faced court martial number three. In his defense, he accused his fellow officers of anti-Semitism. He made a long and impassioned speech complaining of being unfairly treated because of his faith. The court was unsympathetic and returned a verdict of guilty and dismissed him from the Navy in disgrace. After spending a couple of years wandering around Europe and living for a time in Paris, he finally returned home to some astonishing news. After two years, his case finally reached President Monroe’s desk for review. Monroe decided that Levy’s offense was not sufficient for dismissal and the suspension he already served was punishment enough, and he was restored to his position. A fourth court martial over another verbal volley of insults resulted in a draw, both the accuser and the accused being reprimanded. 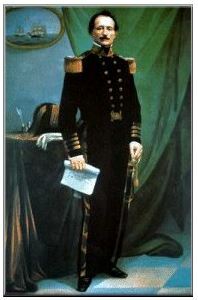 In 1825, Uriah was serving as second lieutenant on the Cyane, which was stationed off the coast of Brazil. While the ship was in port for repairs, Levy witnessed an American seaman being seized by a Brazilian press-gang. The young man called for help. When Levy’s midshipman stepped in to rescue the boy, he was attacked by the Brazilian officer who slashed at him with his saber. Levy stepped in and received the blow, saving the midshipman’s life while incurring slashes to his wrist and his rib. The following day, he received a visit from the Emperor of Brazil Dom Pedro. Pedro had been so impressed with Levy’s bravery that he ordered that Americans were not to be ever again pressed into service of the Brazilian Navy. He then offered Levy a commission in the Brazilian Imperial Navy on its newest ship that had just been built in the United States. Levy politely refused, telling the Emperor, “I would rather serve as a cabin boy in the United States Navy than hold the rank of Admiral in any other service in the world”. Levy became very popular, however his views on flogging were not. He used humiliation as an alternative punishment, which was not appreciated by his fellow officers. Once again, he exchanged words with another officer after his honor, integrity and religion were insulted. He responded by challenging the officer to a duel. A fifth court martial resulted, ending in a public reprimand for Levy. He counter-sued and won, leaving the other officer suspended for a year. This did not endear him to his fellow officers who ostracized and ignored him. Bitter and dejected, Levy asked for and received a six month leave of absence. His commanding officer wryly offered to extend the leave indefinitely, to which Levy inquired if this was because he was a Jew. The officer replied that it was. Levy moved to New York City, where he decided to invest his Navy savings in real estate. Within four years he had become very wealthy. In 1833, he commissioned Pierre Jean David d’Angers to sculpt a statue of Thomas Jefferson, whom Levy considered “one of the greatest men in history”. Levy had the statue delivered to the Capitol with a letter, and after some discussion, Congress finally accepted the gift and placed it in the Rotunda where it stands today. Jefferson had died on July 4, 1826 on the 50th anniversary of the United States. His house, Monticello, and its grounds went to his daughter Martha. After two years, she couldn’t afford the upkeep and offered it for sale. No takers were forthcoming at her asking price of $71,000, and she finally ended up selling it for a mere $7,000 to a man who intended to use the land for growing silkworms. After that venture proved unsuccessful, he left the property abandoned, looted and neglected. Levy made a pilgrimage to the property in 1834 and finding it so run-down, purchased it for $2,700, resolving to restore it to its former glory. As he did so, he moved his mother Rachel Levy to live there permanently, and himself spent summers restoring the house and property. Rachel is buried on the path to the house. In his will, Levy left the house to the People of the United States, or failing that, to the State of Virginia. As it turned out, neither was interested in taking it, so after some time Uriah’s nephew, Congressman Jefferson Monroe Levy, bought out the other heirs and once again restored the property, searching throughout the United States for authentic Jefferson furniture to fill the house. In 1923, Jefferson Levy sold the house and property to the Monticello foundation. Meanwhile, Levy had been petitioning the Navy throughout his leave requesting duty. Finally in 1837, he was promoted to Commander after 20 years as lieutenant. The following year he received orders to take command of the Vandalia. He took this opportunity to eliminate the practice of flogging in favor of new rules for conduct and discipline. As a result of an incident involving a humiliating punishment given to one of his men, he was again court martialed for a sixth time. Once again, he was dismissed from the Navy amid much discrimination on the part of the court. This time, it was President Tyler who reversed the decision, deciding that the ruling against Levy had not been made for the good of the service. He agreed with Levy that flogging should only be used as a last resort and avoided whenever possible. Upon the recommendation of the President, Levy was promoted to Captain. While petitioning for an active duty assignment, Levy devoted time to lobbying the flogging issue and writing pamphlets in support of his cause. Despite opposition from the Navy, an anti-flogging rider was attached to the Naval appropriations bill of 1850 and the practice of flogging was finally outlawed in 1862. In 1855, after petitioning for years for an assignment, Levy, along with 200 other officers, were dismissed from the Navy. Levy was enraged, suspecting discrimination once again and hired a lawyer, Benjamin Butler, who wrote a letter to petition congress to restore Levy to his post. Congress convened a Court of Inquiry in 1857, and the following year Levy along with about a third of the other officers were restored to active duty. Four months later, Levy was given orders to take command of the Macedonian in the Mediterranean squadron, and given the rank of Commodore. Uriah P. Levy died on March 22, 1862 (Adar II 20, 5622). The navy honored him by launching the USS Levy during World War II. At a ceremony on Friday December 16, 2011 attended by hundreds, a 6-foot high bronze statue of Uriah P. Levy was dedicated at Mikveh Israel. 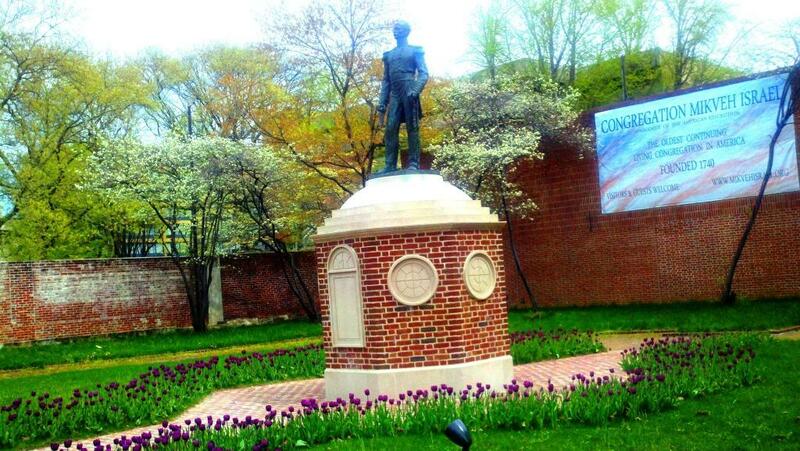 The statue, designed and sculpted by Gregory Pototsky, sits on the Fifth St. lawn facing Independence Mall. The statue and its dedication were made possible by Navy Captain Gary “Yuri” Tabach and Joshua Landes, in association with the Jewish Institute for National Security Affairs. Landes served as the master of ceremonies for the dedication. Addresses were given by Landes’ father, Retired Rear Admiral and Rabbi Emeritus of Congregation Beth Sholom, Aaron Landes, John Lehman, former Secretary of the Navy, Rear Admiral Herman A. Shelanski, and a number of other distinguished speakers. A video of the dedication ceremony can be found at https://www.youtube.com/watch?v=ZLWBo-IrRiA. Uriah Phillips Levy was a proud, determined, forthright, and some would even argue pugnacious man. He was fiercely patriotic and loyal to his country, while at the same time proud of his people, his religion, and his heritage. He was ready at all times to sacrifice his life and his honor in defense of his country or his religion. These qualities were instilled in him from a very early age by his family and he spent his entire life fighting injustice, intolerance, and discrimination. As Levy himself put it, “I am an American, a sailor, and a Jew”. James Morris Morgan, An American Forerunner of Dreyfus, The Century Illustrated Monthly Magazine, 1899. This week we remember the Hashcabah of our dear friend and lifetime member of Mikveh Israel, Berthold Levy who passed away a couple of years ago at the age of 97. Levy was the great grandson of Abraham Sulzberger, who was the first of Bert’s ancestors to come to Philadelphia and begin a long legacy of outstanding and influential members of Mikveh Israel, the wider Jewish community in Philadelphia, and the broader secular society in Philadelphia in general. Abraham Sulzberger was born in Heidelsheim in Baden, Germany on May 20, 1810. His father, Solomon (Meshullam) Sulzberger, had been a Rabbi there and Abraham followed in his father’s footsteps, becoming a scholar in Jewish texts as well as serving as Hazan, reader, shohet (slaughterer) and teacher in his local congregation. 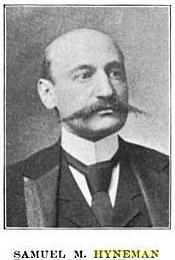 He married Sophia Einstein and had six children, including the famous Judge Mayer Sulzberger who was born on June 22, 1843, and was destined to be the most prominent and influential Philadelphia Jew of his generation, and in 1894 was the first Jew to sit as a judge of the Court of Common Pleas. During the uprising of 1848 in Germany there were reprisals against the Jews, and Sulzberger decided to relocate his family to America. His older brother Leopold had already settled in Philadelphia in 1838, so Abraham prepared the family for the long journey to join him there. The journey began with a trek that lasted for months across Germany and France in a wagon, eventually reaching the French port city of Le Havre. There they boarded a transatlantic steamer called the Splendid, and arrived in New York Harbor on August 11, 1849. From there they made their way to Philadelphia and established themselves in the city and joined Mikveh Israel. The following year, Sulzberger was one of 8 charter members who founded the Har Sinai Lodge of District No. 3 of the B’nai B’rith. Sulzberger served as its president for the next 25 years. During the Civil War, Rev. Isaac Leeser, the former Minister of Mikveh Israel, was very concerned about the wounded Jewish soldiers in the army hospitals. He obtained a hospital pass from his friend General Charles Collis, who was married to Septima Levy, formerly of Charleston. Sulzberger would accompany Leeser on hospital visits to the Jewish wounded. It was just after the Battle of Gettysburg in early July of 1863 that Sulzberger and Leeser began discussing a plan for a hospital. By this time, Leeser had already separated from Mikveh Israel on somewhat unfriendly terms and had become the minister of a new congregation Beth El-Emeth. Because Leeser was a major force behind this initiative, Mikveh Israel was reluctant to work directly with him on the project. They turned next to the new Reform Congregation Keneseth Israel, confident that they find support for the project given the many denominational Christian hospitals that had been built over the previous generation by the Catholic (St. Josephs) and Episcopal Churches, and by the German Christian population (Lankenau). 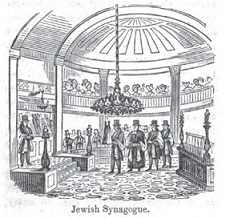 Keneseth Israel was founded in 1847 as an Orthodox synagogue, and in the years just before the first synagogue building was dedicated in 1854, Abraham Sulzberger had helped the congregation as one of the hazanim (readers). Both Rev. Isaac Leeser and Rev. Sabato Morais had taken part in the dedication ceremony of the new building. Within a few years however, the congregation, under the leadership of Rev. L. Naumburg, adopted some of the “innovations” of the Reform Movement such as a mixed choir and the introduction of an organ into the service. Under the leadership of Rev. Dr. Solomon Deutch, who became the Rabbi in 1857, and Rev. Dr. David Einhorn who took over in 1861, the congregation fully became a Reform Congregation. As such, the congregation objected to the strict observance of Kashrut insisted by Sulzberger and Leeser for the new hospital and refused to help. Out of options with the religious institutions, they turned to the B’nai B’rith. Sulzberger was the past President of the local lodge, and Leeser, after initially resisting and opposing the order during its early years as secret society, had joined and moved up through the ranks to a top influential position as Vice-President of the Elim Lodge. During the annual meeting of the Grand Lodge No. 3 of the B’nai B’rith on August 14, 1864, Sulzberger, in calling attention to the fact that three Jews within the previous six months had died in various area Christian hospitals without the option of being fed kosher food or being administered Jewish rites, offered resolutions asking for the appointment of a committee to consider the subject of organizing a Jewish Hospital. 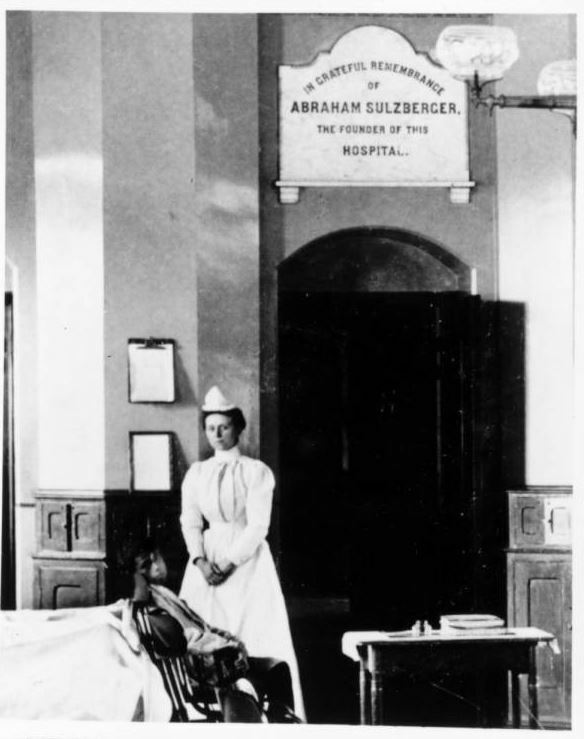 He further noted that both New York City, Cincinnati, and the larger cities in Europe had seen the need and built hospitals for their Jewish populations. It was a discredit, they argued, to the Jewish population of Philadelphia to allow their brethren to be cared for and possibly die in the care of strangers who did not understand or approve of the obligations of Jewish law. That committee was established and included Sulzberger, Rev. Isaac Leeser, Samuel Weil and others. Within a few days a circular was sent to every B’nai B’rith Lodge and all of the congregations and Jewish societies in the area requesting appointments for committees. On December 4, the first meeting of this joint convention was held during which a plan was prepared, and a constitution and by-laws were framed and presented. On Sunday February 19th, 1865, these were ratified by a large meeting of the area Jews at a meeting held at the National Guard’s Hall on Race Street below Sixth. Officers and managers were appointed, including President Alfred T. Jones, Vice President Isadore Binswanger, Treasurer Samuel Weil, and Secretary Mayer Sulzberger. Abraham Sulzberger’s home at 977 North Marshall Street became the temporary headquarters of the provisional committee for the hospital. The Association was incorporated on September 23, 1865 and a lot was soon purchased at 56th Street and Haverford Road in West Philadelphia for $19,625. The Jewish Hospital opened the on August 6, 1866 along with a home for the aged. It started with 22 beds and linens donated by philanthropist Moses Rosenbach. During the first year 71 patients were treated and 5 people were admitted to the old-age home. In 1873, the hospital moved to greatly expanded facilities at Old York Road and Olney Avenue. In 1952, after merging with Northern Liberties Hospital and Mount Sinai Hospital to form a single medical center, it evolved into the Albert Einstein Medical Center. It was very appropriate that Einstein granted permission to use his name for the non-profit organization, as Abraham Sulzberger’s wife Sophia was an ancestor of Albert Einstein. Communal Jewish life in Philadelphia started in the early 1740’s. The small but growing congregation first worshipped together in a small rented house on Sterling Alley, which ran from Cherry to Race Streets, between 3rd and 4th Streets. In 1761, the congregation borrowed a Torah scroll from Shearith Israel in time for the High Holidays of that year. An attempt was made that year to build a synagogue building, but the plans were abandoned at that time due to lack of funds. Over the next ten years, several more Jewish families settled in the city, and in 1771 the tiny congregation incorporated as Kahal Kadosh Mikve Israel and named a president, officers, and a board of trustees. They acquired another Torah scroll and some prayer books from London, and received a gift from Shearith Israel of a silver reading pointer (yad). On February 22, 1773, at a meeting of the Mahamad (Board), it was resolved that they would collect money in order to fund a synagogue building. The subscription was to last for 3 years. The outbreak of the revolutionary war in 1776 put a temporary halt to their plans. As Jewish refugees from other colonial cities streamed into Philadelphia, they soon outgrew their tiny space and moved to the second floor of a rented house on Cherry Alley between 3rd and 4th Streets, about 2 blocks from the present building. In 1782, with a substantial contribution by Haym Salomon and spiritual guidance from Rev. Gershom Mendes Seixas, the congregation purchased land and erected a building on the north side of Cherry Street, west of 3rd. 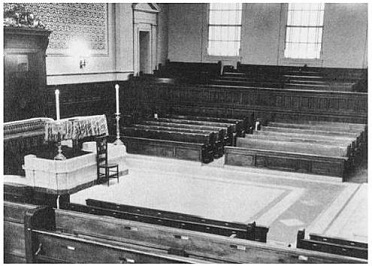 As the congregation grew in the first quarter of the 19th century, more space was needed for the congregation. The great architect William Strickland was engaged to design a new building. Though the cornerstone was laid on September 26, 1822, the building was finally completed and dedicated in a beautiful ceremony on January 21, 1825. The design was inspired by the Neo-Egyptian Style of architecture which had become popular in England after the British General Nelson’s victory at the Battle of the Nile in 1798, and in France after Napoleon’s victory in the Battle of the Pyramids. 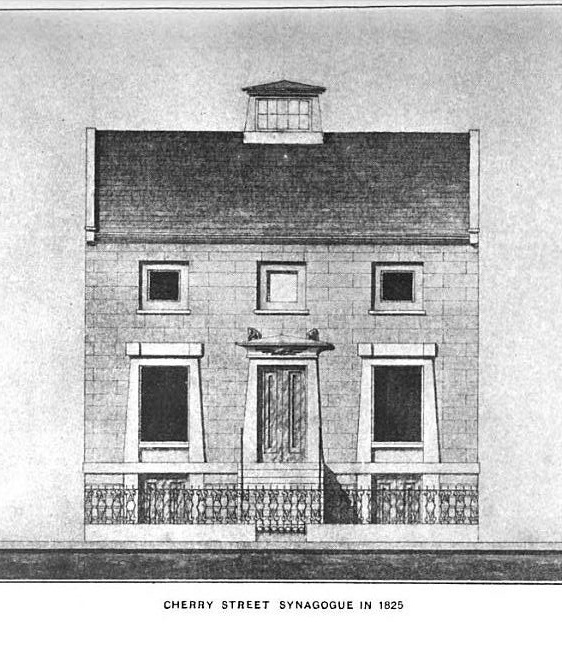 The new Mikveh Israel synagogue building was the first example of this style in Philadelphia. It was a two-storied building with a slate roof with skylight and was twice the size of the original building it replaced. The seats were arranged in two semi-circular blocks on either side of the ark, which was in the eastern end of the building. The dedication ceremony was performed by newly arrived Rev. Abraham Israel Keys, assisted by Rev. Moses Peixotto of Shearith Israel. This building remained for some 30 years before the congregation, swelled by waves of immigrants in the 1840s and 1850s, required larger quarters. Several sites were considered for the new synagogue building, and finally a property was purchased at 117 N. 7th Street in 1858 for $15,100. The cornerstone was laid on May 9, 1859. This third building was designed by John McArthur, who later designed Philadelphia’s City Hall, the tallest and largest building in America at the time. An elaborate dedication ceremony was held on May 24, 1860, with Rev. Dr. Sabato Morais officiating. Instrumental music was furnished by an orchestra, and the vocal selections were arranged by Dr. Morais, based on melodies from the Spanish and Portuguese Congregation of Livorno, Italy. Though the McArthur building lacked the charm of the Strickland synagogue, and did not display any of the more elaborate style of the City Hall building he designed a decade later, it was still a handsome structure of brick and stone with an attractive interior. The sanctuary was situated on the second floor, with galleries above. The first floor was used for school meetings, lectures, committee meetings, and administrative offices. In the rear of the building, was a small house used for the Sexton’s quarters. In 1893, the congregation was notified that a trust, created by Hyman Gratz, became vested in the congregation “in trust for the establishment and support of a college for the education of Jews residing in the city and county of Philadelphia”. Hyman Gratz was the son of Michael Gratz and Miriam Simon Gratz, who were original founding members of Mikveh Israel; Michael was a past Parnas of the congregation. Hyman had been treasurer of Mikveh Israel for 33 years and hand made his money in the insurance business. He created an annuity in the 1850s with a substantial sum of money, which he left in trust in 1856. The proceeds of the trust were to be paid to Mr. Gratz until his death, and then to is adopted son Robert. Only if Robert Gratz died without “lawful issue” (children), would the annuity be paid to Horace Moses, a nephew of Hyman Gratz. Then, only in the case that Horace Moses would die without lawful issue, would the entire trust estate be passed to Mikveh Israel for the establishment of the college. Hyman Gratz died just six weeks after establishing the trust at the age of 81. Neither his adopted son Robert, nor his nephew Horace Moses had any children. Robert died in 1877, and Horace died in 1893. Just a few weeks after his passing, the Parnas of Mikveh Israel, Horace Nathans, appointed a committee to explore ways to fulfill the terms of the trust. That committee, which was afterward reconstituted as the first board of trustees, ultimately recommended establishing Gratz College, which was founded just two years later in 1895. Gratz College officially opened its doors in the 1897-1898 academic year with 29 students and a faculty of three. 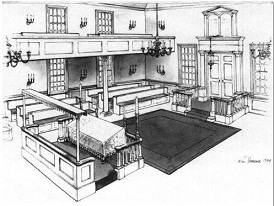 The original classes of Gratz College were held in the Mikveh Israel synagogue. Over the next 10 years, the college grew and needed its own space for classes and administration. In 1907, Dropsie College was founded, funded from a trust bequeathed by its benefactor Moses Dropsie, and established by the leaders of Mikveh Israel as the Dropsie College of Hebrew and Cognate Learning. In 1909, Mikveh Israel established the Mikveh Israel School of Observation and Practice, the first Jewish elementary school of its type in America. Plans were created to build a campus to house all three institutions, as well as a synagogue building for Mikveh Israel, as the directors and administrators of the educational institutions were also the leaders of the congregation. 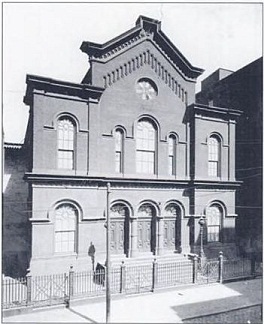 The synagogue building was funded by a donation bequeathed to the congregation of $100,000 by Samuel Elkin in the name of his parents Abraham and Eve Elkin, early members of the congregation. Mr. Elkin died on March 12, 1907, and the executor of his will, his nephew Henry G. Freeman, Jr., stipulated that $40,500 be used to purchase the site, and that the remaining $59,500 be used to construct the building. This was acceptable to the congregation and a committee was appointed to create plans for the new building at Broad and York Streets, as well as the other two buildings to house Gratz College and Dropsie College. They selected the architect firm of Pilcher and Tachau of New York. Tachau had designed many synagogues in his portfolio. The synagogue building was designed as an imposing one-story, fire-proof, limestone building in the Neo-Roman style. Mikveh Israel anchored the site, erected on the corner, with Gratz College behind the synagogue, and Dropsie parallel along Broad Street, set back behind a small lawn. The entrance foyer was elegant and served as a social gathering space for before and after services. Galleries for the women were accessed by broad, low stairways, and comprised a wooden seating section just behind and slightly above the men’s sections which were positioned opposite each other in the identical configuration of the present building. The building held 300 seats in the men’s section and 200 seats in the women’s section. The dedication ceremony was very elaborate. It featured seven circuits around the tebah, in between which were recited different prayers, including memorial prayers for the benefactors and the former ministers, prayers for the congregation and the government, several psalms, and a ceremonial lighting of the perpetual lamp by former Parnas Charles J. Cohen, Esq. Following the circuits were addresses given by Rev. Henry Pereira Mendes, minister of Shearith Israel, Rev. Leon H. Elmaleh, minister of Mikveh Israel, and finally a prayer by the Chief Rabbi of the Central Talmud Torah school, Rabbi B. L. Levinthal. The chanting was led by the Shearith Israel choir, under the leadership of Mr. Leon M. Kramer as a contribution by the officers of Congregation Shearith Israel for the occasion. The congregation had moved to Broad and York to follow the Jewish migration to that part of the city. From the beginning of the 20th century, North Broad Street was home to some of the wealthiest people in Philadelphia who had built mansions along the wide boulevard. Fashionable shops, restaurants, and other businesses lined the corridor. The Jews established a thriving community in this neighborhood. But by the end of World War II, the upwardly mobile children of Jewish immigrants from Eastern Europe, whose parents had been factory workers and laborers in the city’s working-class neighborhoods, began to leave the city and move further north into the near suburbs. The well-established Broad Street synagogues Keneseth Israel, and Adath Jeshurun had moved into the suburbs in the 1950s. It was around this time that the congregation started contemplating following suit and leaving the quickly declining neighborhood. In 1952 they appointed a committee to study the possibility of relocating the congregation, and in the spring of 1953, it presented its report to the board. The conclusion was that the only way to survive would be to move. The committee wrote, “To Continue as at present is to continue a process of attrition. The location is in a non-Jewish, decaying neighborhood. It no longer ‘serves its original purpose’ “. Two proposals were placed before the congregation. One was to move to the northern edge of the city thus serving the many congregants that had moved to the near northern suburbs. 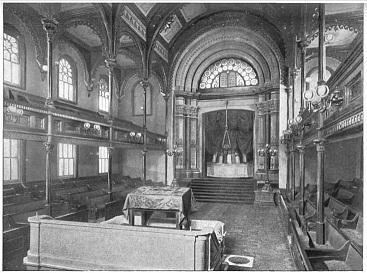 The other was to move the congregation to the historic district of Philadelphia, taking advantage of its rich history as a colonial synagogue which had not only shaped Jewish life in the city, but had contributed to the formation, viability, and character of the nation itself. The committee envisioned a synagogue that would serve its members’ religious needs, but also serve as a living symbol to society at large. In 1953, they hired Architect Louis Magaziner to draw up plans for a new synagogue on Independence Mall. The congregation was deeply divided for many years between the two possible moves which were in opposite directions both literally and ideologically. 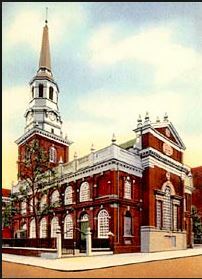 By 1960 however, the board and the congregation were convinced that a move to the historic district would be the best choice, and at the annual congregational meeting in November, the members unanimously approved the purchase of a lot in the Independence Mall area and the subsequent removal of the synagogue to that location. It took most of the next 10 years to negotiate for the land, but eventually a lot was acquired for less than $200,000 from the Philadelphia Redevelopment Authority. In 1961, the congregation hired the prominent architect Louis Kahn. The decision was designed to inspire investors and encourage membership. Kahn’s designs received wide recognition and acclaim both within the city and in New York. Unfortunately, the projected cost of the Kahn project was estimated at five Million dollars, which the congregation determined to be far out of its reach. They were also frustrated with the working relationship with the architect himself. There was also some urgency as 1970 approached. If the synagogue was to participate in the bicentennial festivities, when people from all over the country would be pouring into Philadelphia to celebrate the symbols of its history, the building needed to be completed as quickly as possible. They realized that surrounding the Liberty Bell, which was at the center of the mall, would stand the icons of the nation’s founding and that Mikveh Israel should take its rightful place among them. Under the leadership of Ruth Sarner, the building committee dismissed Mr. Kahn and redrafted a scaled down project with the architect firm of Harbeson, Hough, Livingston, and Larsen. The new project was estimated over three million dollars, but by 1974 only $400,000 had been raised. In a move designed to appeal to investors, the newly incorporated Museum of American Jewish History was placed at the forefront of the project. The design was further scaled back and after selling the museum the entire lot for $1 in exchange for the right to occupy part of the building in perpetuity, the museum received grants from the Bicentennial Commission and the city of more than $200,000, and borrowed another $900,000 to complete the project. On September 12, 1976, in an elaborate ceremony presided by Rabbi Ezekiel N. Musleah, the doors to the new synagogue building were opened and the synagogue was dedicated. The ceremony began with a procession from the Liberty Bell Pavilion to the synagogue with all of the Torah scrolls. Following were seven circuits around the tabah, in between which were prayers for the congregation and for the government, a bicentennial prayer, and a prayer for peace. Afterwards, addresses were given by Haham Solomon Gaon, Rabbi of the Spanish & Portuguese Bevis Marks synagogue of London and professor of Sephardic Studies at Yeshiva University, and Rabbi Gerson D. Cohen, Jewish historian and the chancellor of the Jewish Publication Society. Rev. Dr. Louis G. Gerstein, minister of sister congregation Shearith Israel in New York and Rabbi M. Mitchell Serels of the Yeshiva University Sephardic Studies Program also joined in the ceremonies. This week we remember the Hashcabah of Ellen Phillips, who died on February 2, 1891 (24 Shebat 5651). Ms. Phillips descended from one of the original families of Mikveh Israel, and a long line of illustrious and important leaders in the Jewish community of Philadelphia. She was born on October 30, 1820, the tenth of eleven children of Zalegman Phillips and Arabella Solomons. Nine of the eleven children lived to adulthood, though only three married and had children themselves. Ellen herself never married, which was the case with most of her cousins, nieces and nephews. Those of her relatives who did have children, tended to have very large families. Her father, Zalegman, was one of 21 children of Jonas Phillips and Rebecca Machado. Her aunt Rachel Phillips married Michael Levy and had 10 children, one of whom was Uriah Phillips Levy, the famous Commodore of the US Navy, noted for helping to end the practice of flogging in the Navy, as well as for buying and restoring Monticello, the former home of President Thomas Jefferson. Her uncle Naphtali Phillips, who lived to be 97 years old, had 16 children, 10 with his first wife Rachel Seixas and, after she passed away, he married her cousin Esther Seixas and had 6 more children. Her uncle Benjamin Phillips had 9 children. Ellen Phillips grew up as part of the elite leadership of Mikveh Israel, and it was an integral part of her entire life. Her grandfather Jonas Phillips was the Parnas during the construction of the first synagogue building in 1782. Her uncle Naphtali also served a term as Parnas. Her father Zalegman began his second term as Parnas when Ellen was 2 years old, and held that position until she was 14. He died 5 years later when she was only 19. Her mother had died when she was 11. Zalegman Philips graduated from the University of Pennsylvania in 1795, and was admitted to the Philadelphia Bar in 1799. Over the next few years, he became one of the best criminal lawyers in Philadelphia; he had a large clientele and amassed great wealth. In addition to his work for the congregation, he was very active in communal and charitable institutions. All of his children followed in his footsteps, including Ellen. She was left with substantial wealth and dedicated her life to founding and leading charitable and educational organizations in the City of Philadelphia. It was a tight-knit group of elite Victorian women who worshipped together at Mikveh Israel, socializing together, and joining together in their philanthropic endeavors. The group included Rebecca Gratz, Luisa B, Hart, Simha Peixotto, Mary M. Cohen, and Ellen Phillips among others. They did so with the help and hard work of the Rabbis of Mikveh Israel, first Rev. Isaac Leeser followed by Rev. Sabato Morais, who between them served the congregation and the Jewish community of Philadelphia from 1829 to 1897. Ms. Phillips was a warm, generous, and hard-working woman. She was kind, pleasant and unostentatious in her manners, and humble in her ways. Her satisfaction in life came from helping and educating others, imparting on them her great piety, deep knowledge of Judaism and sincere love and gratitude toward the Almighty. Ms. Phillips spent her entire career ministering to, and aiding and supporting the poor, providing the means for Jewish education of the youth, and working for the well-being of both young and old. She gave tens of thousands of dollars to support the institutions to which she also gave her physical labor and sharp intellect, not the least was supporting the Divine Service and congregational activities at Mikveh Israel. Ms. Phillips was one of the original founders and teachers of the Hebrew Sunday School Society, the brainchild of Rebecca Gratz. Ms. Phillips helped write its constitution, and working together with Ms. Gratz and Luisa B. Hart, launched the organization on March 4, 1838. They were assisted by Rev. Isaac Leeser, who taught classes and wrote a much of the material used for the curriculum. The mission of the school was to provide supplementary religious education to all Jewish children. Rebecca Gratz served as its superintendent for the first 26 years, succeeded by Ms. Hart. 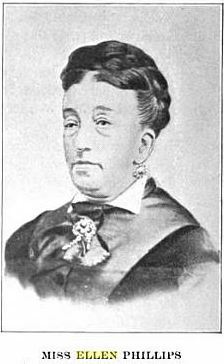 Ellen Phillips assumed the helm as superintendent in 1871. Ms. Phillips recognized that with all of the new Jewish immigrants pouring into the city, changes and improvements would be necessary to accommodate the new students. She divided the school into Northern and Southern schools. Rev. Sabato Morais was deeply devoted to the interests of the school during the years Ms. Phillips ran the school, and was one of the primary teachers. Resolved – That inasmuch as her character was outwardly modest and retiring, so shall the exterior of the Home be unostentatious; as her life was full of beauty and imbued with charity toward all humanity, so shall the Home be fitted with every appliance for the relief and sustenance of its beneficiaries; and, as she was truly a pious and observing Jewess, so may we conduct our house, in the observance of those laws laid down for the benefit and blessing of all Israel. Finally, they resolved that a copy of the resolutions be sent to Ellen’s surviving sister Miss Emily Phillips, and also published in the Jewish Exponent. Ms. Phillips also left money in her will to the Jewish Theological Seminary, the Young Women’s Union, the American Philosophical Society and the Fairmount Park Art Gallery. This week we remember Hazzan Abraham Lopes Cardozo. Rev. Cardozo was Hazzan of Shearith Israel From 1946 until his retirement in 1984. He was the embodiment of the Western Sephardic liturgical tradition that was brought to North America from Amsterdam via Recife, Montreal, and the Caribbean, among other places. He was the spiritual and musical teacher of the present Rabbi of Mikveh Israel, R. Albert Gabbai, bringing some of his rich influence to Philadelphia. Rabbi Gabbai would often invite Rev. Cardozo to come to Philadelphia for High Holidays and other occasions after his retirement. Rev. Cardozo was born on September 27, 1914. His father, Joseph Lopes Cardozo, was the leader of the boys choir at the Spanish and Portuguese synagogue in Amsterdam. He was also a violinist, and along with Cardozo and his two brothers, the foursome formed a band that played at various gatherings and communal holiday celebrations. They all could play keyboards and also string, reed, and brass instruments. Of course, Bram, as Abraham Cardozo was known, grew up completely immersed in music of all kinds and had a natural talent. He even played piano as a toddler. As he grew, he could play any piece he heard by ear. At 18, Bram Cardozo earned his degree as a Hebrew teacher from the Ets Haim Seminary in Amsterdam. A few years later in 1938, he answered an advertisement for a Hazzan who was needed for a congregation in Surinam, Zedek Ve-Shalom. The ad was placed by his future father-in-law, Judah Robles, who was Parnas of the synagogue at the time. After much deliberation over different candidates, Bram Cardozo was chosen because of his credentials and also because the salary, paid for by the Dutch government, and living conditions were appropriate for a single young man. He arrived in Paramaribo, Suriname on September 9, 1939. As it turned out, this appointment saved his life. All of the rest of his family in Holland perished in the Holocaust. Throughout his life, he observed Tisha B’Ab as the Nahalah (anniversary) for all of his relatives that were murdered, as this is the national Jewish day of mourning. 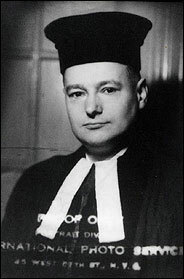 In 1945, Rev. Cardozo took a six-month leave of absence from his job as Hazzan in Suriname, and headed to New York. The Suriname community was declining in the wake of the war, and he wanted to expand his horizons and look for other opportunities. New York City provided the perfect vibrant Jewish community for him to spread his wings. Of course, Rev. Cardozo found his way to the Spanish and Portuguese synagogue, Shearith Israel. There, as a visiting Hazzan of a sister synagogue, he was invited to lead services. This led to an offer to join the congregational staff as an Assistant Hazzan, which he accepted. After returning to Suriname to give notice to a very disappointed Mr. Robles, be began his long tenure at Shearith Israel on January 1, 1946. Immediately on starting as Hazzan, Rev. Cardozo reunited with the daughter of his former Parnas in Suriname, Irma Miriam Robles, who was working in New York and attending Shearith Israel regularly. They shared many of the same friends and grew close over the next few years. In December of 1950 they became engaged, and had a beautiful wedding on March 11, 1951, officiated by Rev. Dr. David de Sola Pool of Shearith Israel, assistant minister Rev. Dr. Louis Gerstein, and Rev. David Jessurun Cardozo, the Rabbi of sister congregation Mikveh Israel in Philadelphia. Of course, the first piece of furniture they acquired for their new home was a piano – a Baldwin Acrosonic upright. The Cardozos had two daughters, Debby and Judy born in 1952 and 1955. Rev. Cardozo was devoted to and strictly upheld the Spanish and Portuguese minhag, though in his private life he also appreciated other traditions. In many ways he was a living bridge between the Old World represented by the Amsterdam Sephardi community which was made up of descendants of refugees from the Inquisition in Spain and Portugal, and the New World in the first congregation in America. As the Amsterdam community was being decimated by the Nazis, Cardozo escaped just in time and continued the traditions in the New World. Rabbi Marc Angel, long time Rabbi of Shearith Israel speaking at his funeral in 2006, said that Rev. Cardozo was an ember that survived the ashes of the Holocaust. Rev. Cardozo’s passion in life was Hazzanut, and there was nothing he enjoyed more than leading the congregation in prayer using the tunes he knew and loved so well. Sadly though, as he was required to strictly maintain the Shearith Israel minhag, he was prevented from introducing some of the other Spanish and Portuguese melodies from the mother synagogue in his native Amsterdam that he so eagerly wanted to keep alive. Though he was not given the title of Minister of the congregation until late in life, he performed weddings, funerals, and gave eloquent eulogies. After he retired, he wrote two books, each with an accompanying CD of music. The first was Sephardic Songs of Praise, followed a couple of years later by Selected Sephardic Chants. Many of his friends collaborated to present a petition to Queen Beatrix of the Netherlands, nominating Rev. Cardozo for the title of “Knight in the Order of Orange Nassau” for his service during World War II, his preserving the traditions and minhag as practiced for hundreds of years in Amsterdam, and his loyal and proud representation of the Dutch Jewish Heritage. He was officially knighted in the year 2000. In March 2005, Rev. Cardozo fell and broke his hip. Unfortunately, he never fully recovered and passed away on February 21, 2006 (23 Shebat 5766) at the age of 92. Hundreds of people came to the synagogue to attend his funeral and pay their respects to this great and humble man and leader of the community for 60 years. Eulogies were given by dozens of leaders, rabbis, colleagues, close friends and family. Rabbi Angel led the hakafot (circuits) around the coffin in a very moving ceremony, after which the coffin was draped with his Talet (prayer shawl). I just want to share one very small personal anecdote. 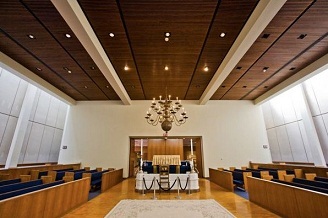 I used to lead the Friday night Shabbat service at Mikveh Israel. One time when Rev. Cardozo was visiting for Shabbat at the invitation of Rabbi Gabbai, he led the Friday night service faster than I have ever heard it done. It was so fast, I could hardly follow along. After the service, as I was wishing him a Shabbat Shalom, I remarked on the speed with which he read the service. He replied, with a twinkle in his eye, “they don’t call me the Flying Dutchman for nothing!”. This week we remember the Hashcabah of Isaac Hyneman. Mr. Hyneman was a prominent member of Mikveh Israel. He was Born in 1804 in Hofgeismar, Hesse-Cassel, Germany and died on January 14, 1886 (8 Shebat, 5646). He came to Philadelphia in the early 1830s. Soon after, he moved to Richmond, Virginia and in 1834 married Adeline Ezekiel, who was born in Philadelphia May 10, 1815, but was at the time living in Richmond, VA. Together they had five sons, Augustus, Leon, Jacob, Herman, and Samuel, all of whom were prominent in the Congregation Mikveh Israel and in the secular community. They lived in Richmond until 1850, when the family moved to Philadelphia. In their adult lives Leon, Jacob, and Samuel lived in Philadelphia, and Augustus and Herman resided in New York. In 1836, Isaac entered into the dry goods business with his brother-in-law, Adeline’s brother Jacob Ezekiel, under the firm name of Ezekiel & Hyneman. The business was very successful and gave Isaac the resources to give generously of his time and money to many Jewish Educational and Charitable associations in Philadelphia. He was on the Board of Offices of the Hebrew Education Society. Adeline Hyneman was very active in the affairs of the Jewish community and contributed her time and concern to a number of charitable organizations. She was a manager for the Jewish Foster Home and Orphan Asylum. Son Samuel Morais Hyneman was a lawyer of some renown, having been admitted to the Philadelphia Bar in 1877. In the 1880s and 1890s, he was a director of the Hebrew Education Society. 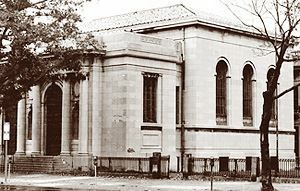 A few years later, in 1893, the large Hyman Gratz trust came into the control of Mikveh Israel with the expressed purpose of establishing and maintaining a Jewish College in Philadelphia. Samuel Hyneman served on the Permanent Committee to establish Gratz College and make Gratz’ dream a reality. He also helped establish the Association of Jewish Immigrants. Samuel Hyneman also served on the Board of Managers of Mikveh Israel, elected in 1894 as one of the Adjunta (Directors). Son Jacob Ezekiel Hyneman was born in Richmond, Virginia on August 5, 1843, but moved with his family to Philadelphia in 1850. Jacob Hyneman became a military man. He received his college education at Strasburg Academy in Lancaster County, PA and enlisted in the army to fight for the Union in August 1862. He fought and was wounded in numerous battles of the Civil War, including Fredericksburg, Gettysburg, and Appomattox Court House. He was present at Lee’s Surrender on April 9, 1865. After the war, he joined the National Guard of Pennsylvania, where he rose to First Lieutenant in 1880, and Quartermaster with the rank of Captain in 1883. He resigned from the National Guard in 1891 and started an Insurance Agency, which grew to be one of the largest in Pennsylvania. He devoted much time and money to furthering many of the principal Jewish agencies in Philadelphia. Jacob and Samuel both were long-time members of the Union League of Philadelphia. He also served with Samuel on the Board of Managers of Mikveh Israel. In Samuel Hazards United States Commercial and Statistical Register of 1840, published in Philadelphia, he notes a Meeting of the Israelites in Richmond, August 18, 1840, in which four resolutions were adopted. These were described in detail. The first was that “the Israelites of the State of Virginia unite in sentiments of sorrow and sympathy, for the unparalleled cruelties and sufferings inflicted on their innocent and unoffending brethren of Rhodes and Damascus”. Another expressed gratitude toward their Christian brethren for helping to prevent future aggressions. The third resolved that the Israelites of Virginia would unite with their brethren throughout the Union in diffusing the blessings of civil and religious liberty. The last resolved to appoint a committee that would meet and confer with other Israelite groups in order to carry out resolutions. Isaac Hyneman was appointed to this committee, and his partner and brother-in-law Jacob Ezekiel was appointed Secretary.